The city seal of Lowell, Massachusetts. Lowell’s city flag, like so many, places the city seal on a plain field — an example of the infamous “seal on a bedsheet”. And, yes, there is a Roman Mars-inspired grassroots effort underway to improve it at lowellflag.com. But just as a city must continuously reinvent itself to survive in post industrial America, so must the meaning of a city seal evolve. In the twenty-first century, Lowell sees the creative economy as vital to its future and “art” as that word is now commonly understood, is a major part of that effort. In 1836, the billowing smokestacks of the city seal were a glimpse into the future; today they are a peek back into the past. In 1836, “art” referred to the work of those who built the first looms and locomotives; today it points to those who use paint or pixels to propel Lowell into the future. The same insight applies to flag creation and adoption as well: while this used to be a matter of textiles and top-down management, it is increasingly becoming a matter of digital media and online organizing. In terms of organizing, as in the case of Dallas, rather than running a big, public flag design contest, the Lowell Flag group is using Facebook to do more focused brainstorming. And, as with Dallas, the process has been bootstrapped by the organizer, Mark van Der Hyde, providing an initial proposal to get things rolling. 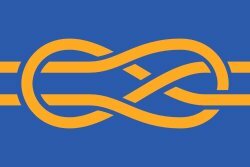 His initial design — prominently marked “not 100% final or even a direction we have to take” — is abstract but with multiple layers of symbolism. Eight-pointed stars, inspired by quilt designs, represent people of Lowell. 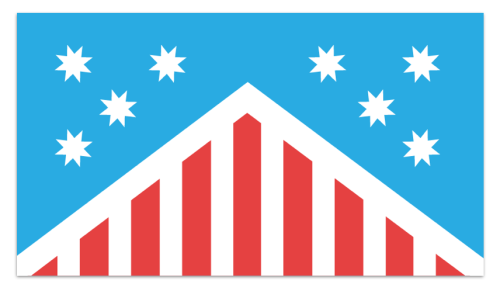 This is reminiscent of the Chicago flag’s design, in which stars and even star points have been given particular historical and symbolic meanings. The effort in Lowell appears to have been started in late August of this year. It will be interesting to see where it leads. 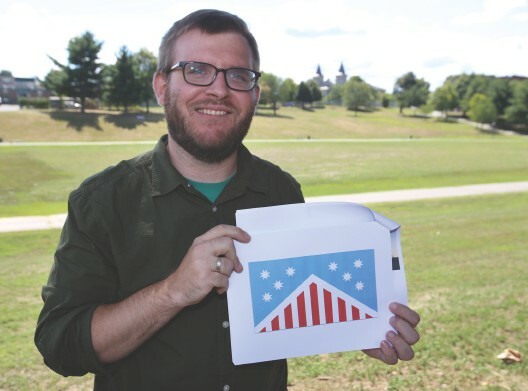 For more information, check out this article in The Lowell Sun: Proposed flag design pays tribute to Lowell heritage. In the early 1990s when computer-maker Wang collapsed and defense contractor Raytheon downsized, many Lowell residents lost their jobs and city leaders scrambled to find a new economic development strategy. They turned to the arts. Taking advantage of a high vacancy rate in downtown office buildings, Lowell marketed the renovated and rezoned spaces to artists squeezed out of Greater Boston by rising real estate costs. The artists, both those in fact and those at heart, came in great numbers, embracing Lowell and its heritage with the zeal of the recent convert. But it wasn’t just affordable real estate that drew these newcomers to Lowell. It was also the city’s official seal. 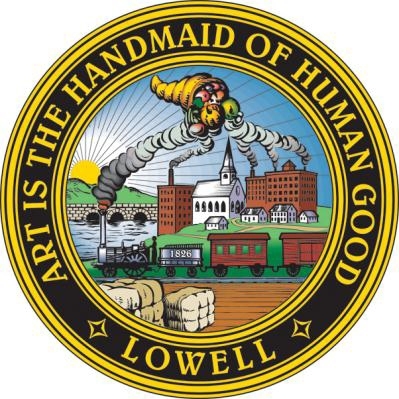 Inscribed around its circumference with the motto “Art is the Handmaid of Human Good,” the city of Lowell’s seal emits a magnetic tug on creative individuals. How could an artist resist living in a place that exalted art in such a tangible way? Well, as is usually the case when it comes to Lowell, it’s not quite that simple. Lowell was conceived in November 1821 when a group of men whose roster reads like a city street atlas (Appleton, Jackson, Dutton and Moody) visited the Pawtucket Falls in search of sufficient hydro-power to run the massive textile mills envisioned by their recently deceased muse, Francis Cabot Lowell. With the Merrimack River dropping 32 feet in less than a mile, the site was perfect and the ambitious industrialists quietly purchased the defunct Pawtucket Canal and most of the sparsely settled farmland around it. The new enterprise succeeded beyond all expectations. Initially unconcerned about local governance and content to remain part of Chelmsford, the mill owners soon realized that their governmental needs were incompatible with those of their rural hosts and successfully petitioned the state legislature to carve out a new town from Chelmsford. Named for their deceased friend and mentor, Francis Cabot Lowell, the new town was born on March 1, 1826. Lowell’s explosive growth continued, causing its leaders to return to the legislature a decade later to obtain a city charter. One of the first acts of the city of Lowell was to adopt an official seal. Chosen by a committee of five elected officials whose reasoning has been lost to history, the new seal was rich with symbolism. Four of the symbols — a body of water, some mill buildings, two cotton bales and a cornucopia hanging above — are relatively unambiguous and represented the Merrimack River which powered the mills that turned raw cotton into finished cloth, thereby producing the city’s prosperity. The presence of a train in the seal is understandable. The Boston and Lowell Railroad, the idea of Lowell’s Patrick Tracy Jackson, commenced operations in 1835 making it one of America’s first steam powered railroads while the Lowell Machine Shop became one of the earliest producers of locomotives in the country. Another symbol is more of a mystery. Several smokestacks spewing large plumes of dark smoke are omnipresent even though none of Lowell’s mills employed steam as a supplement to water power until after the Civil War. Perhaps the seal’s 1836 designers were gazing into the future to the day when the city’s rapid growth would outstrip the available water power and make the use of still-novel steam power a precondition to continued expansion. While the aforementioned symbols have always been present in city seals, other symbols appear only sporadically. Distant mountains, presumably representing the source of the Merrimack in the White Mountains of New Hampshire, were visible in seals used in 1854, 1886 and 1894 but absent from the one used in 1840. The 1840 seal shows a canal boat atop the”bridge” being towed by a horse making it not a bridge but a viaduct of the Middlesex Canal. Although the bridge had nothing atop it in 1854 or 1886, it held a carriage being pulled towards the city by a horse in 1894. The 1886 seal alone has a prominent drawing of the sun rising or setting behind the mountains. In 1894, amongst the mill smokestacks appears another vertical structure, the well-defined steeple of St Patrick’s Church suggesting that by then-Irish officeholders had a say in modifications to the city seal. For all the changes to the seal over time, one thing that remained constant was the motto inscribed around its circumference. While there is little direct evidence of the meaning of”Art is the Handmaid of Human Good” the word “art” as used in the motto almost certainly meant mechanical ability, skill, and inventiveness and not painting or sculpture. Lowell has produced many notable artists but in the nineteenth century they were ancillary to the main mission of the city which was the production of textiles. In 1836, Lowell exalted not the portrait painter but the skilled mechanic, men like Paul Moody who took the dream of Francis Cabot Lowell and translated it into tangible machines of wood and iron that when employed in massive numbers created a manufacturing system of a scale as yet unknown in the world. It was the “art” of these mechanics, these artisans, that was most valued by the founders of Lowell. But just as a city must continuously reinvent itself to survive in post industrial America, so must the meaning of a city seal evolve. In the twenty-first century, Lowell sees the creative economy as vital to its future and “art”as that word is now commonly understood, is a major part of that effort. In 1836, the billowing smokestacks of the city seal were a glimpse into the future; today they are a peek back into the past. In 1836, “art” referred to the work of those who built the first looms and locomotives; today it points to those who use paint or pixels to propel Lowell into the future. Previous Previous post: Dallas = The Pegasus and The Trinity?